A massively increased price-tag for the bank bailout by the Fianna Fail/Green Party government has left the 26-County state braced for deeper cuts and rising taxes and blighted the state’s finances for a generation. On a day dubbed ‘Black Thursday’, Finance Minister Brian Lenihan insisted the 26 Counties had hit “rock bottom”, and indicated his government’s corrupt mismanagement of the financial system would cost the Irish people no more than 50 billion euro. He warned that December’s austerity budget would now be “significantly” harsher than feared -- pushing the cuts needed well above the 3 billion euro already indicated and threatening the collapse of Taoiseach Brian Cowen’s hopelessly fragile administration. 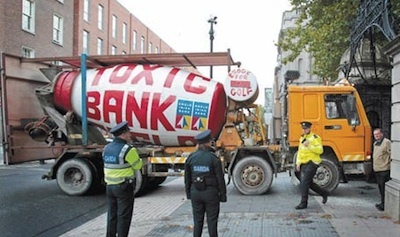 Lenihan revealed what he promised would be the final cost of keeping the fraudulent Anglo Irish Bank alive and stepping in to shore-up other financial institutions who lent billions to developers, many of them connected to Fianna Fail, even at the height of Ireland’s property bubble. As ministers scrambled to try and absorb the massive cost of the bailout, unions warned them not to put the wages of teachers, nurses and other public sector workers in danger again by invoking the emergency get-out clause of the recent Croke Park pay deal. Opposition parties accused the Taoiseach of presiding over an economic and financial disaster, insisting he had no mandate to draw up a new four-year austerity budget plan which is to be submitted to the European Union next month. Fine Gael finance spokesman Michael Noonan said the state’s credit rating status was now in tatters, which was the real reason ministers had abandoned plans to raise extra cash via the sale of Government bonds in the next two months. Mr Noonan said the Government had almost ruined the country in its blind obsession with Anglo, describing the Government as “a losing gambler unable to quit betting”. Families, taxpayers and welfare recipients were once again put in the financial firing line after the Central Bank massively increased the final cost estimate for the bank bailout to the taxpayer from 33 billion euro to almost 50 billion euro. Anglo alone will eat up two-thirds of that, with a “worst-case scenario” bill of 34.3 billion euro. This will push the budget deficit up to 32% of gross domestic product, 10 times the EU limit, and shackle the state with a total debt burden equivalent to almost 100% of GDP. In a day of frenetic financial activity, the Dublin government also moved to effectively nationalise AIB with a three billion euro cash injection and announced it was pumping an additional 2.7 billion euro into Irish Nationwide. Mr Lenihan, who initially claimed the bailout would not cost taxpayers a cent, refused to accept any of the blame for the situation and he insisted that the country could cope. “Yes of course these figures are horrendous, but they can be managed over a 10-year period,” he said. He attempted to play down the crisis by pointing out that the cost of servicing the new debt is only a fraction of the state’s existing annual budget deficit. The minister said he did not expect schools and hospitals to close as a result of the Anglo pay-out, which is equivalent to more than everything the state will receive in taxes this year. However, he insisted that fundamental changes in the state’s public services would be triggered by it. Labour’s Joan Burton said the announcements of increased bailout costs marked a “day of infamy” which would haunt generations to come. Sinn Fein Dail Leader Caoimhghin O Caolain tabled a motion of no confidence in the Finance Minister. “It is our belief that Minister Lenihan withheld information from the Dail when he asked for support for the original bank guarantee scheme,” he told the Dublin parliament. Mr O Caolain said that economic recovery required the removal of the Fianna Fail/Green government and of their policies. “The priority of the Sinn Fein Oireachtas members in this new term is to rid the country of this totally discredited Government. Having bankrupted the public purse, Fianna Fail and the Greens are now politically bankrupt. They are running out of road. “In the weeks ahead they are planning more savage cuts to public services - and for what? Not to balance the books but to continue to bail out Anglo-Irish Bank. What we need is investment in jobs not in zombie banks. “While they impose their savage cuts they are depending on a rump of backbenchers whose only concern is the retention of their jobs as TDs. “The jobs that should be concerning this Government are jobs for the 455,000 unemployed in this State. “Two years after the crash the Taoiseach has unveiled a very belated jobs plan of sorts - but it’s all targets and little substance. It’s on a par with the promise they made, and have yet failed to fund, to supply IT equipment to every classroom in our secondary schools. “We are challenging the Government in the courts on their failure to hold a by-election in Donegal South-West that is now outstanding for well over 15 months. All three outstanding by-elections should be held this autumn. Meanwhile, tens of thousands of people took to the streets of some of Europe’s biggest cities yesterday as workers sent a strong warning to governments across the continent. In Ireland, Catalonia, Belgium, Spain, Greece and around ten other countries, well-attended demonstrations, called by the European Trades Union Confederation [ETUC], were held in opposition to the ruthless economic austerity plans of the economic and political status quo. The major march of the day took place in Brussels, where around 100,000 demonstrators from various surrounding countries gathered in defence of workers’ rights and public services.